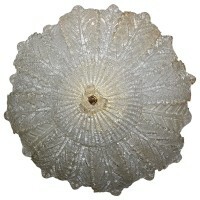 Large Barovier & Toso glass leaf shaped form flush mount ceiling light chandelier. The reverse side of the leaf in the “Rugiadoso” technique with scattered fine particles of glass that diffuses light. Suspended on gold plated steel frame with six 40-watt candelabra size bulbs, newly wired.